Last night, Captain Danny (a moniker he earned whilst we were on a canal boat holiday in Yorkshire some moons ago and somehow fitting here in waterside Sydney) made me my first Lobster Thermidor. A phrase that makes me think of Scott Fitzgerald cavorting on the Riviera with Zelda. Or of Diaghilev wooing Nijinsky. Or of Evelyn Waugh trying to impress Nancy Mitford, hoping his wit will outshine his middle class boorishness. The sort of entree that Noel Coward and Princess Margaret were always throwing down their necks at intimate soirees on Caribbean islands in the 50s. I bet it's what Roger Federer eats when he lunches with Anna Wintour (although she just has the salad). The French invented it in the 1890s, brash Americans ordered it all over Europe in the 1920s, Bulgarian oligarchs are gobbling it up in the 2010s. Lobsters - still very much a status symbol and like champagne, priced astronomically out of proportion to their true worth. Lobster Thermidor clings valiantly on to its status as a dish for special occasions only. I wanted to know. And now I do. Sort of. It's all rather complicated. The recipe is named after a play by Victorien Sardou which was in turn named after a summer month in the French Republican Calendar (who knew there was one?) which was in turn named after the Greek word for heat. The Thermidorian Reaction was a revolt in the French Revolution against the excesses of the reign of terror and it ended the most radical phase of the revolution. (Sardou is best known for La Tosca, a play plundered with great success by Puccini but called "an empty-headed ghost of a shocker" by pompous old George Bernard Shaw. Offenbach, Massenet and Saint-Saens all wrote incidental music for Sardou's plays - a pretty impressive list of collaborators). 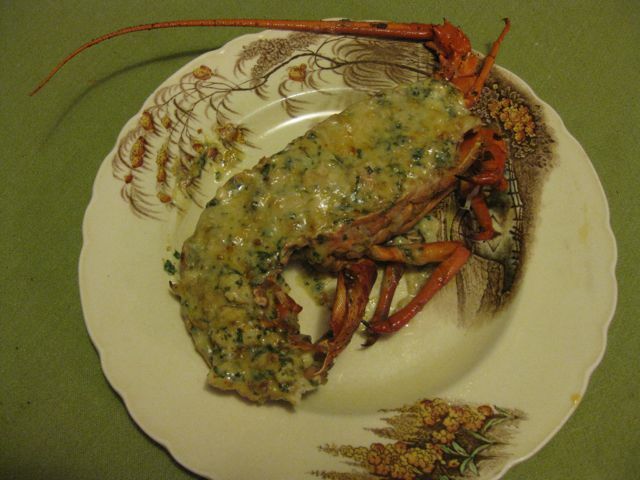 Lobster Thermidor was created by the chef at Marie's, a Parisian restaurant near the Comedie-Francaise where Sardou's Thermidor opened in 1894. 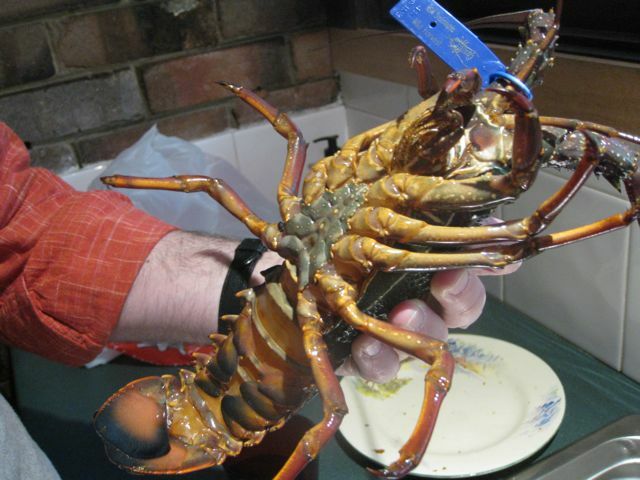 We bought our live lobster at Sydney Fish Market. The fish market here would have been the subject of its own blog as a thing I like about Sydney but for the fact that it is a) impossible to park there b) overrun with tourists and seagulls and c) rather shoddy. Yes, it's a treasure trove of fish, an Aladdin's cave of seafood, but unless you go there early on a weekday morning, it's always rather overwhelming. And as Captain Danny is the fish expert in this household (he knows a sparkling eye on a mackerel when he sees one) I always end up meandering about outside the market looking after Sniff and watching people stuff their faces with deep fried calamari whilst the Cap'n peruses the goods. Armed with a tightly wrapped live lobster and a rather large snapper for the main course, we head home from the fish market contemplating the brutality that lies ahead. 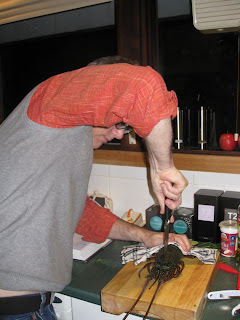 The most humane way it seems to kill a lobster is to put it in the freezer for a couple of hours so that when you attack it with a large knife it's already either dead or numb to the pain. So Captain Danny duly placed Mr. Lobster in the freezer. When he brought him out two hours later there was still the faint wriggling of limbs to be discerned so back he went to his icy grave. That extra half an hour seemed to do the trick and when he next emerged Mr. Lobster seemed dead to the world. 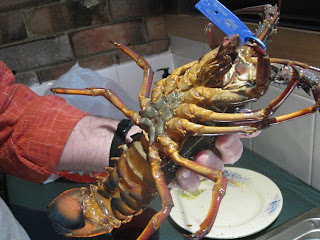 Unfortunately, Australian lobsters seem to be markedly different from those described in Leith's Fish Bible (which really should be renamed Captain Danny's Fish Bible) where Ms Leith describes a certain cross on the lobster's carapace which conveniently marks the spot at which to drive your knife in for the deadly blow. Mr. Lobster bore no such markings. Captain Danny had to plunge unguided into the heart of the beast. Here he is delivering the coup de grace. There followed some grunting and puffing (from Captain Danny not the lobster) as the knife sliced through all that knobbly exoskeleton before two halves of lobster were presented ready for their thermidorisation. 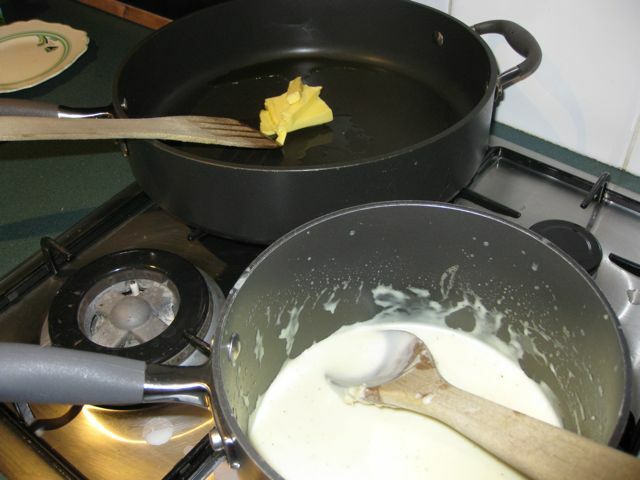 Captain Danny is a dab hand at making a roux which is lucky because you need one for Lobster Thermidor, along with a whole heap of fresh herbs (chervil, parsley, tarragon) some mustard, some parmesan and some secret ingredients which the Captain refused to divulge. (He also refused to divulge how much Mr. 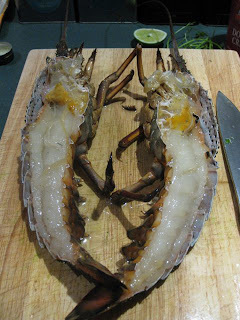 Lobster cost). 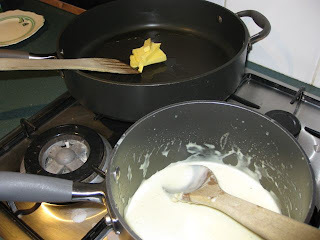 My culinary skills don't extend to white sauces. Brown ones, red ones, yellow ones, green ones, fine. But those white ones scare me. Then it appeared. Captain Danny's Lobster Thermidor. In all its glory (and matching the tablecloth I would like to add...). I can only say it was a triumph, each delicious mouthful a double-edged sword - a marvel but never to be repeated. Mr. Lobster could last only so long. This is why it is such a special dish - there's never enough. You're always left wanting more. I will leave you with the comforting thought that, although Mr. 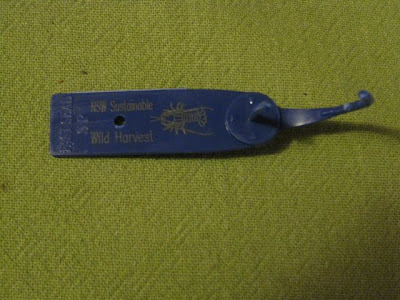 Lobster had to sacrifice his life for our momentary pleasure, he was at least eco-friendly and came from a good family...Mr. Lobster, we thank you. We salute you. Why did Cap'n Danny not do one for Mr & Mrs C when they struggled across the world and back just to see you both at Christmas? They'll save up for a brace to celebrate your return to their debt-ridden nation, but the Cap'n's killing and cooking skills will be needed. A triumph indeeeed Captain D. I can't remember your pseudonym from the barge Jonty. 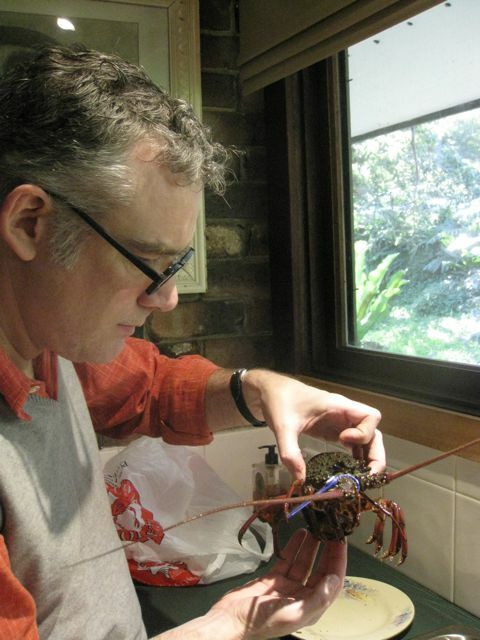 I have to say I've never fancied the lobster on account of imagining I'd be imagining the screams/boiling water scenario with every bite - but freezing to death, that's manageable. The other barrier between me and the pink ones have been the utensils and protective clothing required to eat the damn things, but again Cap'n Danny appears to have neatly circumvented my objection with his exquisitely layed open specimen. Mmmmm - I'm in the queue for this behind Coopers major please.